Washington, D.C. (March 27, 2017) - The John F. Kennedy Center for the Performing Arts announced today the Lexington County School District One Board of Trustees in Lexington, South Carolina, has received the 29th annual Kennecy Center and National School Boards Association (NSBA) Award. The award, which includes a $10,00 prize, was presented on Saturday, March 25, at the NSBA's Annual Conference in Denver, Colorado. Read the entire press release here. 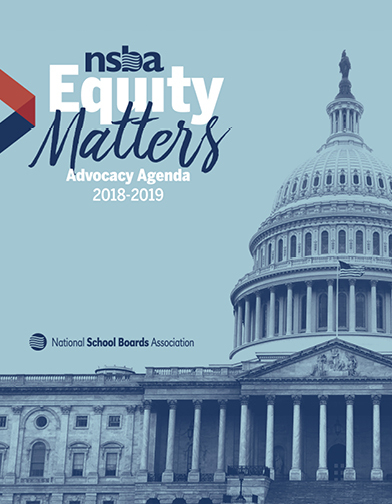 Alexandria, Va. (March 27, 2017) — The National School Boards Association (NSBA) today announces its president and board leadership for 2017-18: Kevin E. Ciak of New Jersey’s Sayreville Public Schools, President; Frank C. Pugh of California’s Santa Rosa City Schools District, President-elect; Beth Branham of South Carolina’s Lexington School District Two, Secretary-Treasurer. Miranda A. Beard of Mississippi’s Laurel School District will now serve as Immediate Past-President. Alexandria, Va. (March 22, 2017) - The National School Boards Association’s Council of School Attorneys (COSA) will present its Lifetime Achievement Award to Martin Semple on March 24, 2017. The 2017 class -- Allovue, FressGrade, k12itc, and Living Tree --will be featured in an exclusive area of the exhibition and participate in a Tech Innovation Showcase panel during the NSBA Annual Conference in Denver, March 25-27, 2017. Later this summer, they will be featured in NSBA’s magazine for school leaders, American School Board Journal, and participate in a webinar hosted by NSBA’s Technology Leadership Network (TLN). Alexandria, Va. (March 17, 2017) – Upper St. Clair School District, in Upper St. Clair, Pennsylvania; Piscataway Township Schools, in Piscataway, New Jersey; and Vancouver Public Schools, in Vancouver, Washington have been named the grand prize winners in the 23rd annual Magna Awards program. Sponsored by the National School Boards Association’s (NSBA’s) flagship magazine, American School Board Journal (ASBJ), the Magna Awards recognize school districts and their leaders for taking bold and innovative steps to improve the lives of students and their communities. The Magna Awards are supported by Sodexo, a leader in delivering sustainable, integrated facilities management and food service operations. "If we want a brighter future for our children and country, we must focus our attention on making our public schools the best they can be. Investing in our public schools, which educate nine of every 10 students, is the best investment the federal government can make to drive the economy forward and enhance the quality of life for generations of people. “NSBA congratulates Betsy DeVos on her confirmation as the 11th United States Secretary of Education. We look forward to working with Secretary DeVos to enhance public education and ensure that every child has an opportunity to a high quality education. Alexandria, Va., (February 6, 2017) -- More than six decades after Brown v. Board of Education, far too many schoolchildren still attend segregated schools. A new report from the National School Boards Association’s (NSBA) Center for Public Education (CPE), “School Segregation Then & Now,” finds that integrated schools hold greater potential for helping all students succeed both academically and socially. According to CPE’s study, the composition of our school communities matters --for improving outcomes for students and their communities, and the long-term stability and prosperity of our nation. The positive effects of diversity shouldn’t be overlooked, rather, education policymakers can and should advance their efforts to purposefully increase diversity.